Literary critic; son of David Atlas; born March 5, 1851, in Beisegola, in the government of Kowno, Russia. His early years were spent at Novo Zhagory in the study of the Talmud. In 1884 he arrived at Warsaw and became one of the chief contributors to the yearbook "Ha-Asif," which N. Sokolow then published. In 1888 he edited the year-book "Ha-Kerem," of which only one number appeared. Next, he collected a number of literary essays, which he had published from time to time in "Ha-Ẓefirah," and issued them under the title ("What Is Progressive and What Retrogressive," Warsaw, 1898).In 1900 he again contributed to Sokolow's "Sefer ha-Shanah." Atlas' occupation is that of a bookkeeper. In 1895 he settled at Byelostok, in the government of Grodno, Russia. When practically unknown in the literary world, he was entrusted with the criticism of such important works as Herzberg's "Handelsgeschichte der Juden des Alterthums" and the third volume of I. H. Weiss' (History of Jewish Tradition), besides six other works of minor importance ("Ha-Asif," i. 24-37, 229-250). This work brought him into prominence. The review of Herzberg's book is practically a sketch of the progress of trade among the ancient Hebrews, following in the main the outline of Herzberg, but showing, nevertheless, independent reasoning and fearless criticism, and proving that the critic was as much at home in the subject as the author. His criticism of Weiss showed that he was in his element when dealing with Talmudic literature. Atlas' critical studies in the second year of the "Ha-Asif" range over works widely divergent in character. 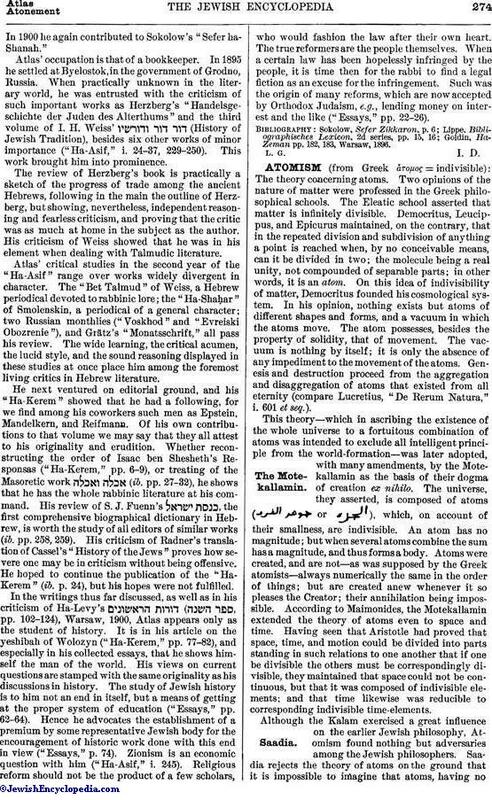 The "Bet Talmud" of Weiss, a Hebrew periodical devoted to rabbinic lore; the "Ha-Shaḥar" of Smolenskin, a periodical of a general character; two Russian monthlies ("Voskhod" and "Evreiski Obozrenie"), and Grätz's "Monatsschrift," all pass his review. The wide learning, the critical acumen, the lucid style, and the sound reasoning displayed in these studies at once place him among the foremost living critics in Hebrew literature. He next ventured on editorial ground, and his "Ha-Kerem" showed that he had a following, for we find among his coworkers such men as Epstein, Mandelkern, and Reifmann. Of his own contributions to that volume we may say that they all attest to his originality and erudition. Whether reconstructing the order of Isaac ben Shesheth's Responsas ("Ha-Kerem," pp. 6-9), or treating of the Masoretic work (ib. pp. 27-32), he shows that he has the whole rabbinic literature at his command. His review of S. J. Fuenn's , the first comprehensive biographical dictionary in Hebrew, is worth the study of all editors of similar works (ib. pp. 258, 259). His criticism of Radner's translation of Cassel's "History, of the Jews" proves how severe one may be in criticism without being offensive. He hoped to continue the publication of the "HaKerem" (ib. p. 24), but his hopes were not fulfilled. In the writings thus far discussed, as well as in his criticism of Ha-Levy's pp. 102-124), Warsaw, 1900, Atlas appears only as the student of history. 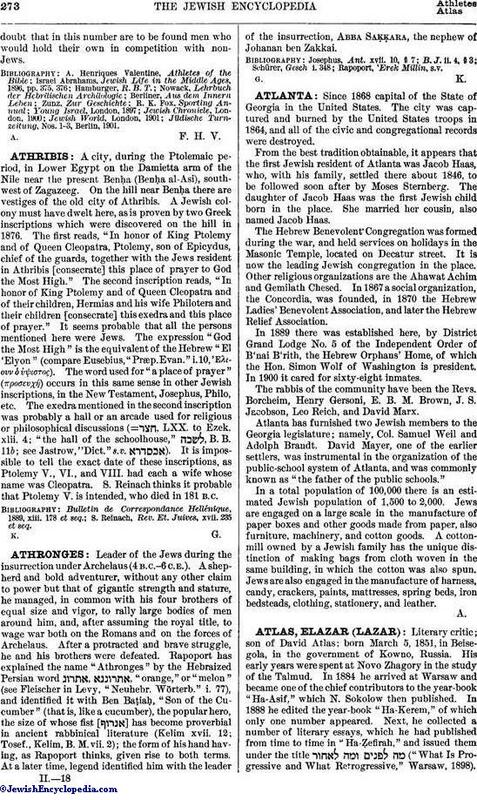 It is in his article on the yeshibah of Wolozyn ("Ha-Kerem," pp. 77-82), and especially in his collected essays, that he shows himself the man of the world. His views on current questions are stamped with the same originality as his discussions in history. The study of Jewish history is to him not an end in itself, but a means of getting at the proper system of education ("Essays," pp. 62-64). Hence he advocates the establishment of a premium by some representative Jewish body for the encouragement of historic work done with this end in view ("Essays," p. 74). Zionism is an economic question with him ("Ha-Asif," i. 245). Religious reform should not be the product of a few scholars, who would fashion the law after their own heart. The true reformers are the people themselves. When a certain law has been hopelessly infringed by the people, it is time then for the rabbi to find a legal fiction as an excuse for the infringement. Such was the origin of many reforms, which are now accepted by Orthodox Judaism, e.g., lending money on interest and the like ("Essays," pp. 22-26). Goldin, Ha-Zeman pp. 182, 183, Warsaw, 1896.